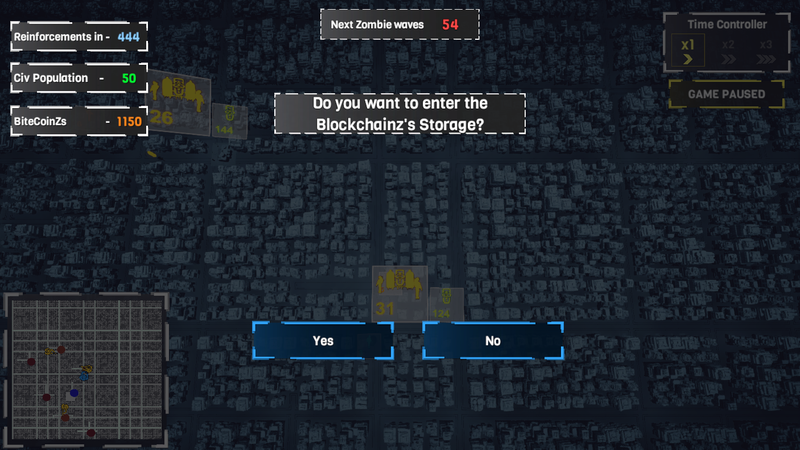 In Project BlockchainZ you will fight in a procedurally generated map where you can find different goals managing the whole action strategically. This procedural map will be your Worldmap. On the top left corner you'll see how long will reinforcements take to arrive at the bunker. Also, you will notice how many civils are inside the bunker and how much BitecoinZs do you have to spend in the technology's store. 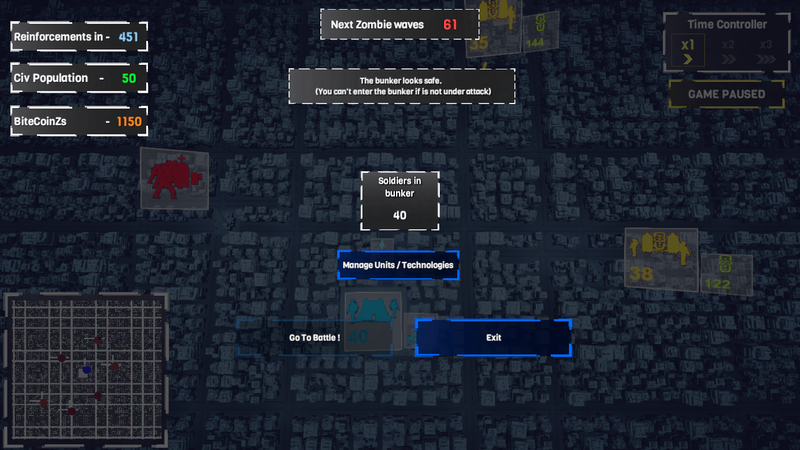 In the middle up of the screen, there will be an alert when a new wave of zombies begin to wander the city in search of survivors. Time Controller is for the speed while moving across the worldmap. Finally, there is a mini map on the left bottom corner where you will notice all the events around the worldmap. The Bunker. The place where you can manage your soldiers, train them and buy some technologies. 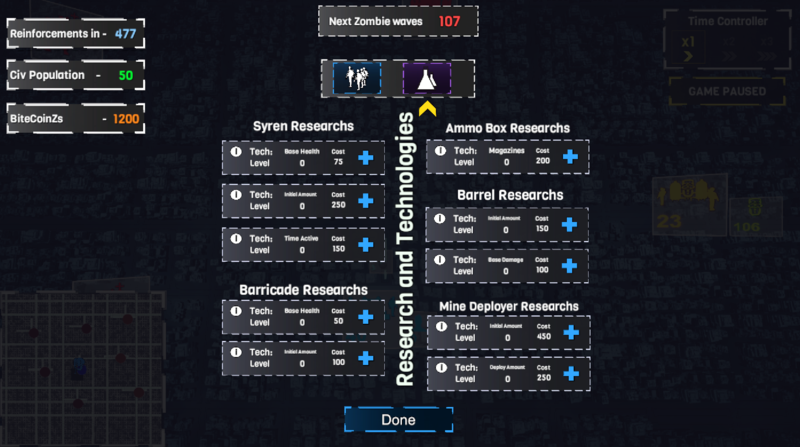 These upgrades will improve your character Arsenal increasing your chances of survival. Zombie Hatch: it is formed by zombie tombs (remember: we are still thinking on the zombie idea and what kind of creature could fit better in the story). 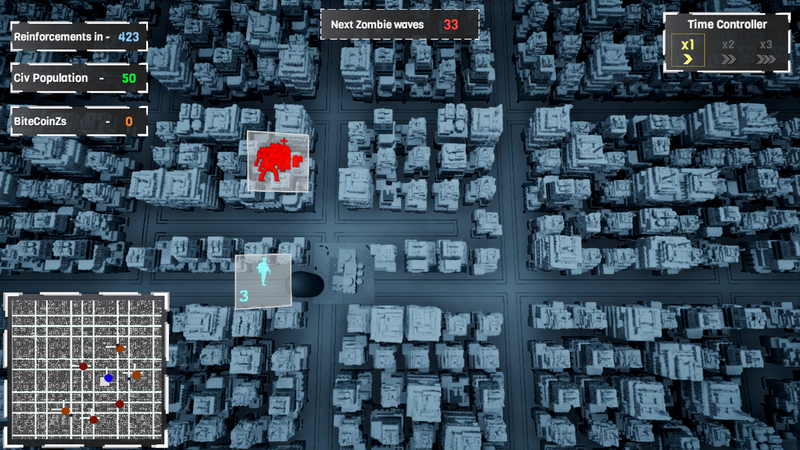 If you destroy the zombie hatch, you will prevent zombies from spawning in that area. Raiders encounters: sometimes you'll come across bandits outside their encampments. You can try to run, but sometimes fleeing is not an option . Surviving the bandit encounter will reward you with BiteCoinZs. 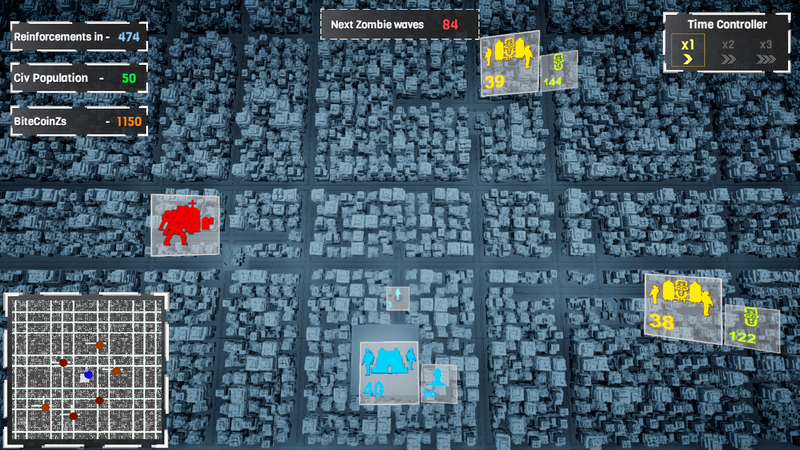 Zombie waves: the worldmap is crowded with zombies walking around the streets ready to kill you. Exterminating the Hordes will reward you with experience and BiteCoinZs. Raiders with hostages: With the Fall of civilization the slave trade rears its ugly head once more, raider will take surviving civilians prisoner and it is up to save them from their fate as slaves or zombie food. 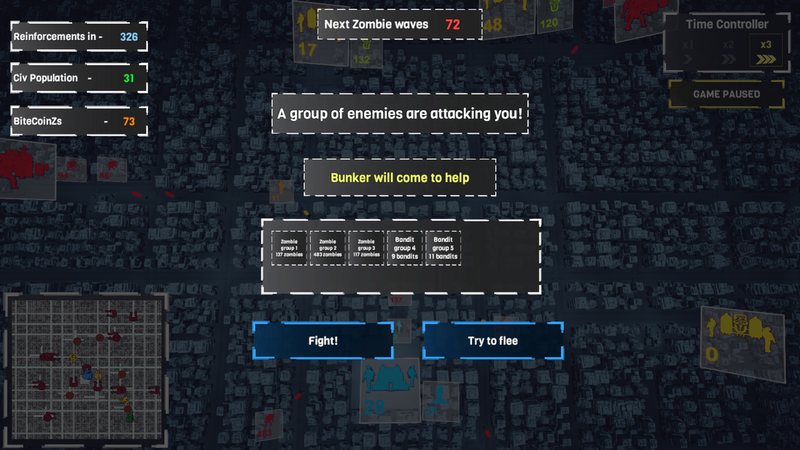 Rescued civilians will go directly to your bunker. Move freely among objectives around the worldmap but be careful, this world is full of dangerous situations and you must manage the risk of every single action to anticipate your enemies movement and choose how to fight every battle. Through the Worldmap you will manage train your troops, buy equipment to use on the battlefield and many more possibilities. 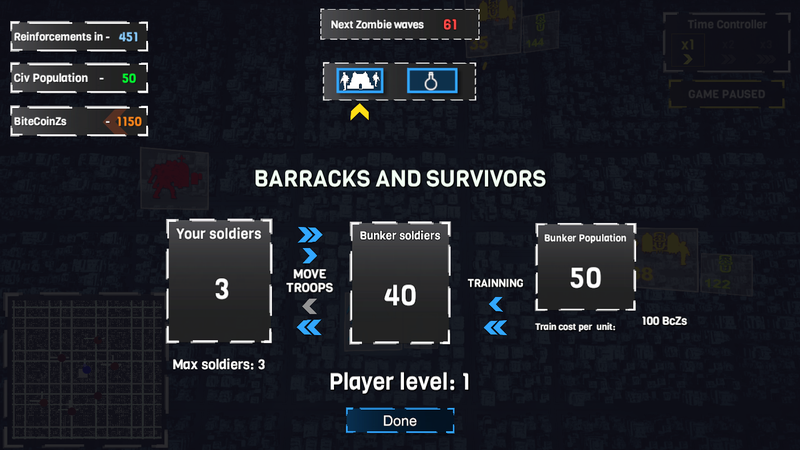 In the worldmap you will be able to manage the challenges of every battle in order to succeed. There are many technologies at your disposal all of which can be bought with the Bitecoins you earn in the battlefield. Right now, we are thinking on new technologies, so any suggestion is welcome. You can comment here or talk about it on our Discord Server. Thanks for all, guys! Next update: a patch is coming!